SCAA certified coffee makers are the A-list celebrities of home brewing coffee makers. If a machine gets the nod from the SCAA it’s a pretty big deal. The Specialty Coffee Association of America (SCAA) is a non-profit organization focused on sharing coffee knowledge and defining coffee standards in pursuit of the perfect cup. The standards they’ve compiled relate to each step in the process from green coffee, cupping, roasting, water quality and finally brewing. If you’re a home brewer then the water quality standards are probably the ones you really want to pay attention to. The SCAA have also taken to testing home coffee brewers in an effort to separate the “excellent” from the “not bad”. If a coffee machine passes their rigorous testing and makes it onto the SCAA list then it’s generally a safe bet that it’ll make a really good cup of coffee. Once a machine gets on the list the certification lasts for 3 years or until the model changes. Not being on the list doesn’t necessarily mean that a coffee machine isn’t any good though. There’s a 4-figure fee that needs to be paid just to get the SCAA to test the machine. Some manufacturers either feel that they can’t afford the fee to have each of their models tested or simply don’t like the idea of paying someone to confirm how good their machine is. These are the best certified coffee makers 2018! When you consider how many coffee makers are on the market today and how short the SCAA certified home brewers list is then you begin to understand how tough it is to get this badge of honor. Any one of the machines on their list will do a good job but if you’re looking for the best SCAA certified coffee makers then check out our favorites below. If you want more detail of the exact testing process and SCAA certification requirements I’ve put together an explanation further down in this post in the blue box. Before we get to that let’s get straight into our reviews of the best SCAA certified coffee makers. SCAA Home Brewer Certification - What Does It Take To Make The List? 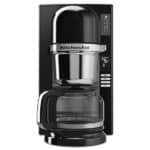 If you’ve got deep pockets and don’t mind paying for quality then the Technivorm Moccamaster range of products are a good bet. Especially if you like simple, clean designs and prefer your appliances made somewhere other than China. These are probably the most expensive coffee machines on the SCAA list but there’s a good reason for this. They’re handmade in the Netherlands so you get the excellent quality you’d expect from a product made in Europe. They’ve been in business since 1964 so you’re also getting a coffee maker with a good pedigree and solid history behind it. The majority of the Moccamaster options are within their K series with a few options available in their C series. The main difference between these is that the K series has a rectangular tower housing while the C series has a round tower housing. 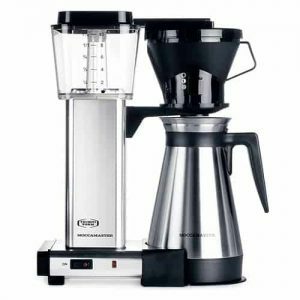 Technivorm Moccamaster - The Best Automatic Drip Coffee Maker? Some models come with a glass or stainless steel thermal carafe while with some of the others you’ll need to buy a separate carafe. These great machines will make anywhere between 1 and 10 cups with a full carafe being brewed in about 6 minutes. I really like the fact that these coffee brewers just have a simple on-off interface with no fancy gadgets, gauges or settings. 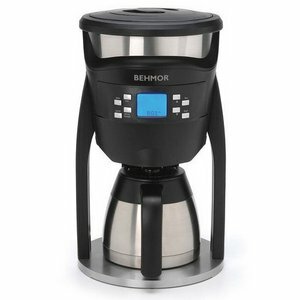 If you like a bit more control and enjoy tweaking your brew process to get it just right then both the Behmor Connected and the Behmor Brazen would fit the bill. These great brewers give you the the ability to customize each aspect of your brew while still maintaining the convenience of an auto drip machine. 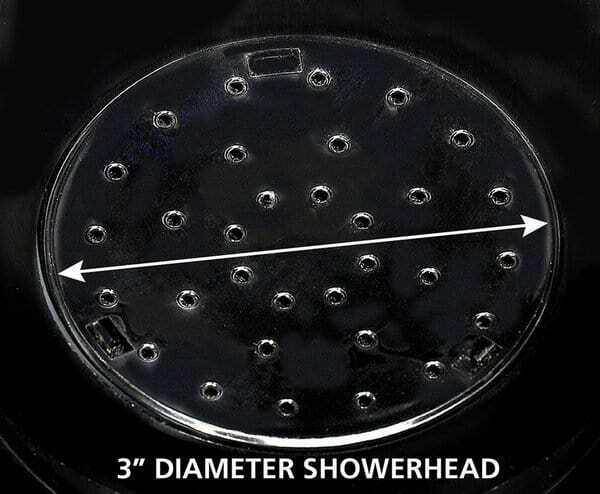 Both the Brazen and the Connected allow for adjustable water temperature and pre-soak times. You can set the brewing temperature anywhere from 190-210F although I'd suggest aiming somewhere around the sweet spot of 195-205F. If you want to get that perfect bloom going you can experiment with pre-soak times between 15 seconds up to 4 minutes. One of the big reasons that this machine makes such good coffee is the oversized shower head that fully saturates all the coffee grounds. The water flow is also pulsed which creates turbulence in the grounds to ensure maximum extraction. Both machines can be programmed to have your brew ready for your when you wake up. 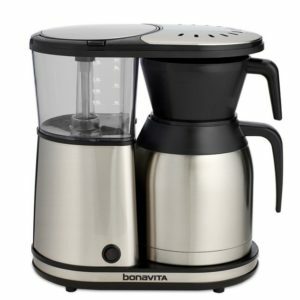 Both models come with a stainless steel double walled thermal carafe that does a great job of keeping the coffee hot. The carafe has a brew through lid so you don't lose any heat during the brewing process. 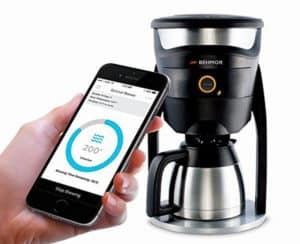 If you prefer ordering your coffee from bed then get the Behmor Connected and load the free app on your Apple or Android device. You can control all the functionality from your phone, including how many cups you want brewed. The app keeps you updated on each stage of the brew and you’ll even get a text message when your coffee is ready. 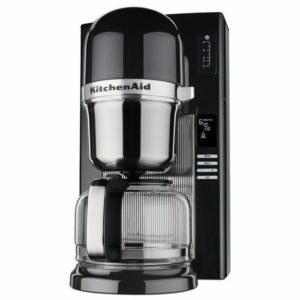 If you already have some KitchenAid appliances on your counter this great brewer will fit in with them perfectly. It’s got the typical KitchenAid design elements but with a more modern feel about it. If you’ve perfected the pour over technique then you know how good coffee can be if it’s done right. It does take a bit of practice and effort though. This custom pour over brewer delivers consistent infused flavor by mimicking the pour over process without any of the manual effort. Once the water is up to temperature it is dispensed over the grounds, alternating between pouring and steeping to get maximum extraction. One of the reasons it delivers such good coffee is that the water is heated to be between 198F-204F directly above the brewer. That way you know the temperature is spot on when it hits the grounds in the basket. It doesn’t use a thermal carafe but the warming plate will keep the coffee hot for up to one hour without ever raising the temperature of the coffee. That way you know it’ll be hot when you come for a second cup but it’s not ever going to have that burnt taste you get from the cheap coffee machines. You can select to brew between 1 and 8 cups and it takes around 6 to 8 minutes to brew 8 cups. If you like the idea of one touch brewing then go for the KCM0801OB. There are no fancy settings just a single button to push and some indicator lights, instead of a digital display, to let you know what stage of brewing it’s busy with. If you prefer a digital display and want more control like 24-hour programmability, roast selector and cup quantity selection then go for the KCM0802. There’s a significant price difference but it’s a good option if you like to use dark roast beans one day and a lighter roast the next. Using the roast selector will vary the process so that you always get maximum flavors and subtleties from the different roasts. Just because a home brewer made the SCAA list doesn’t mean that it has to be expensive. If you want consistently good coffee from a reliable machine at a great price then the BV1900TS and BV1900TD machines from Bonavita are a solid choice. These are simple one touch brewers which is great if you like your coffee brewed with minimum fuss and fiddling. There is an optional pre-infusion mode that you engage by pressing and holding the brew button for 5 seconds but that’s the full extent of any customization you get. Using this mode will wet the grounds to allow for a period of degassing before dispensing the water again to begin the brewing stage. These machines use a large shower head that delivers better saturation of the grounds to give you uniform extraction. Both machines make use of a filter basket that sits directly on top of the carafe rather than inside the machine. This design minimizes the distance the coffee has to travel so you don’t lose any heat but it does mean that you need to be a little careful when removing the carafe along with the basket after brewing. The carafe doesn’t have a brew through lid so you’ll need to pop the lid on after removing the brew basket. If you like the idea of a programmable brewer then for few more dollars the TD version gives you this functionality along with a digital display. This model is available exclusively from William Sonoma. The TS model has no display and can’t be programmed but is available pretty much everywhere. Both machines deliver consistently good coffee with the least amount of effort and are really well priced. 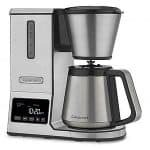 If you’re looking for a coffee maker that is really pleasing to the eye and you don’t mind shelling out $200 or $300 then the OXO On Brain brewers are sure to impress. 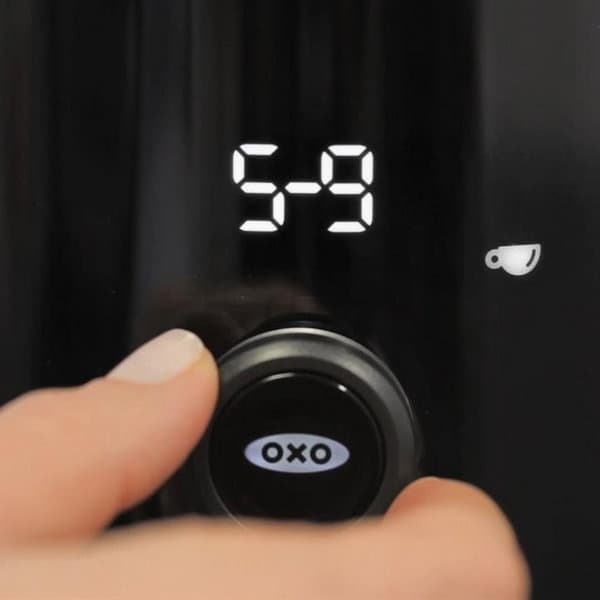 I just love their design but the OXO On Barista Brain is more than just a pretty face. It’s got some real smarts too. The “Brain” in the model name refers to the fact that they’ve built in some smart microprocessor electronics to control all the critical elements of a perfectly brewed cup of coffee. It monitors everything from the precision controlled water temperature, the carefully measured amount of water that is dispensed as well as the timing of the brew. Brew between 4 and either 9 or 12 cups depending on the model you choose. A little water is first dispensed into the brew basket for an initial bloom and then carefully timed cycles of water are dispensed to get full flavor extraction. By controlling each step the Brain allows the brewer to mimic a perfect pour over process that delivers consistently good coffee. Because the machine has everything under control there aren’t any brew settings that you can change. While some might not like the lack of control, it does mean that you get rock solid consistency with every brew. The only option you have is in choosing how many cups you want to brew. You can brew between 4 and either 9 or 12 cups depending on the model you choose. Unfortunately there’s no option to brew a single cup. The 9 cup option is only available from Williams Sonoma. It is programmable and it comes with digital display. The 12 cup model comes with a simple one button interface and also has a removable kettle which makes refilling a whole lot easier. With this brewer Oxo On have truly combined art and science to make a really attractive coffee maker that impresses with every cup. If you’re spending more than a hundred bucks on a coffee maker then you want to be sure that it’s going to last. The 3 year warranty and a company heritage stretching back to 1840 makes this great brewer from BUNN an appliance that will be making you coffee for years to come. All Bunn coffee makers are designed and assembled in the USA although some of the individual components are imported. They claim that the excellent coffee this brewer makes is down to their proprietary “Heat & Release” technology. I’m not sure why they feel that heating water and then releasing it over coffee is a proprietary concept but they do seem to have the temperature and timing spot on. The digital thermometer in the water heater ensures that the water is heated to 197.6F before it is dispensed it via a 6-stream spray head. I really like the drip-free carafe that it comes with. No more cleaning up after pouring a few cups. You can use the one touch brew button or program it to have your coffee ready for you when you wake up. It takes around 10 minutes to brew a full carafe. If you’re already a fan of Cuisinart appliances then the PurePrecision brewer would be a great addition to your kitchen. This is probably the best Cuisinart coffee maker on the market and its SCAA certification is well earned. The brew process is fully automatic but you do have some control over the strength of the brew and the temperature of the water. The flavor control lets you select between mild, medium or bold and will require a little experimentation depending on the kind of roast you’re using. Essentially it either speeds up or slows down the flow of water to vary the extraction. As for temperature control, you have the option of “hot” or “extra hot”. Exactly what temperature these settings refer to I couldn’t tell you. The end result is either a great cup of coffee or a slightly hotter, equally great cup of coffee. I like the clean design lines and stainless steel finish of this machine but it’s the consistent quality of the coffee that will keep you coming back for more. 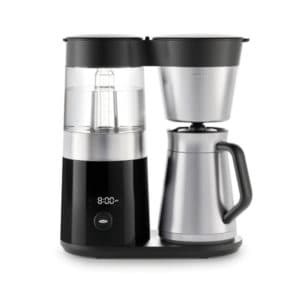 The CPO-800 model comes with a glass carafe or, for an extra $20 or so, you can get the ﻿﻿CPO-850 that comes with a stainless steel thermal carafe with brew through lid. Making the perfect cup of coffee is one part art, one part science and a whole lot of consistency. Here’s a brief look at the criteria the SCAA uses when they decide whether to add a home brewer to their list or not. 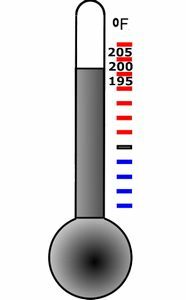 For optimum extraction the water temperature needs to be between 92 and 96 degrees Celsius (197.6F - 204.8F). This is the temperature it needs to be when the water drips onto the coffee grounds, not when it ends up in the carafe. The SCAA place a temperature sensor in the middle of the coffee grounds in the basket and insist that the temperature hits 92 Celsius within the first minute of brewing, maintains at least that temperature and never gets hotter than 96 degrees while brewing a full pot. It’s all fine and well if your coffee maker can make a good cup once but will it be able to do it 10 times in a row? Also, if you put two of the same machines next to each other will they both give you exactly the same quality cup? The SCAA take between 5 and 10 of each brewer they test and then have each brewer go through 10 brew cycles. They then use a refractometer to check the amount of solubles in each cup. The solubles concentration, for each cup, must range between 1.15% to 1.35% and the solubles yield must be between 18% and 22%. If just one of those brewers hit the mark then that model doesn’t get approved. There’s no point putting the perfect amount of coffee grounds in the brew basket if you don’t manage to wet it all. To check this the SCAA test requires three brew sequences to be done with samples of the grounds taken from different points in the basket for testing. They then check to see how many soluble solids are still in the grounds. If the grounds were properly wetted then most of the soluble solids should now be in the coffee in the carafe. If they weren’t properly wetted then they would still be in the grounds. They give their measurements an index of between 0 and 100 with a score of 60 required for a pass. If you’ve ever had a gritty cup of coffee you know how that can detract from the experience. Avoiding sediment completely is pretty much impossible but there shouldn’t be a lot of it. They take a filter, weigh it, pour 100 grams of brewed coffee through it, dry the filter and then weigh it again. If there’s an increase in weight it’s because of the sediment that was in the coffee. If the brewer produces more than 75 milligrams of sediment for 100ml of brewed coffee then it doesn’t make the grade. There’s no point having a 10 cup water reservoir and an 8 cup carafe. That’s a sure recipe for a countertop coffee flood. The SCAA requirement is that the carafe must be able to hold the coffee that is brewed when the water reservoir is filled to it’s maximum indicate level. The carafe also needs to keep the coffee warm but not burn it. The minimum requirement is that it keeps the coffee above 80 degrees C but no hotter than 85 degrees C for the first 30 minutes after the brew is completed. It also isn’t allowed to increase the temperature of the coffee at any time. There are one or two more things that they insist on during their testing. 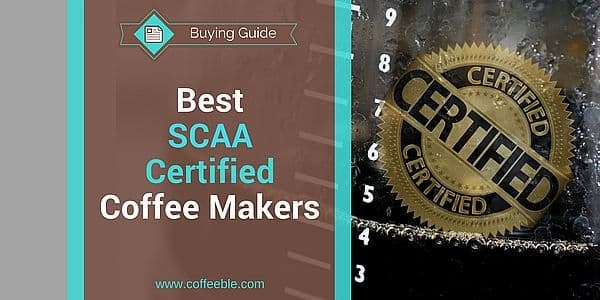 If you’re interested in reading about the details of the testing that they do you can check out the SCAA’s page. For the most part you’re not going to find cheap coffee makers in the SCAA certified list. When you see the kind of rigorous testing they put these brewers through you quickly realize that only the best of the best will make it. Designing that level of quality into a product is going to add to the cost. The SCAA badge has become a bit of a status symbol in the coffee brewer community but it’s a badge with substance behind it. It is only given to a home brewer that delivers a consistently excellent cup of coffee every time you use it. 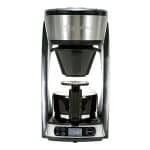 If you’re looking to buy the best SCAA certified coffee maker then any one of the ones we reviewed above will fit the bill. The variance in styling between the different models may mean that you choose one simply because it compliments your existing appliances. Maybe you love the one touch button interface or perhaps you prefer a brewer with more control or that is programmable. You may simply prefer to stick with a brand that you’ve had good experiences with in the past. Either way, the fact that each of these coffee makers carries the SCAA stamp of approval means that regardless of the one you choose you’re guaranteed a great cup of coffee. So tell me, what is your favorite SCAA certified coffee maker and do you own one?